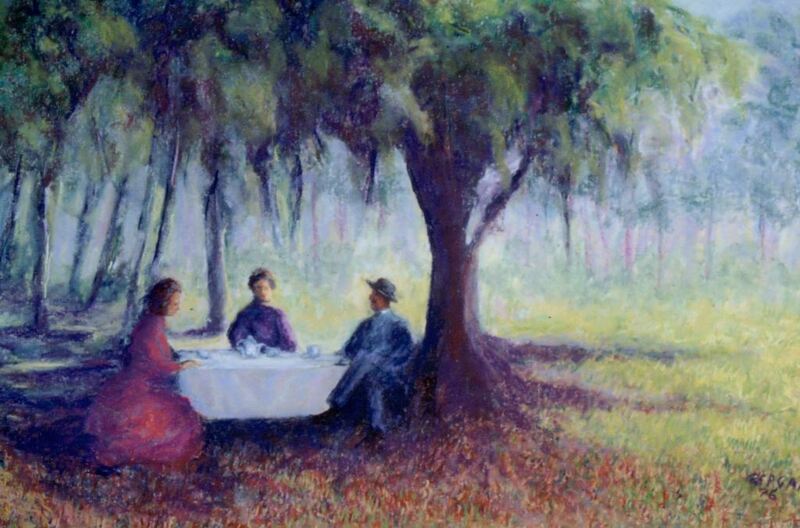 A painting by Bettye Reagan, a local artist in Central Florida, inspired by a photograph of George W. B. Dakin with his daughter, Florence Dakin, and wife, Anna Marie Olcott Dakin, at the Racimo Plantation, an orange grove along the St. Johns River, in 1887. The caption incorrectly cites the name of Dakin's wife as Anne Maria. Dakin purchased property near Georgetown, Florida, in the early 1880s and settled his family there. Within the next decade, his son, Leonard Dakin, who took the photograph, developed the Racimo Plantation with 5,000 orange trees, 40 laborers, and a packinghouse. The grove was destroyed by a freeze in 1895. Original painting: Reagan, Bettye. Dakin Family. 1997: Private Collection of Bettye Reagan. Digital reproduction of original painting: Reagan, Bettye. Dakin Family. 1997. "<a href="https://richesmi.cah.ucf.edu/omeka2/items/show/6358" target="_blank">Florence Dakin, Anna Marie Olcott Dakin, and George W. B. Dakin at the Racimo Plantation</a>." RICHES of Central Florida. https://richesmi.cah.ucf.edu/omeka2/items/show/6358. "Florence Dakin picnicking with her parents at the Racimo Plantation - Georgetown Region, Florida." Florida Memory. https://www.floridamemory.com/items/show/27452. "George Dakin and his son Leonard (in buggy) at the Racimo Plantation - Georgetown Region, Florida." Florida Memory. https://www.floridamemory.com/items/show/27460. Reagan, Bettye Jean Aulin. 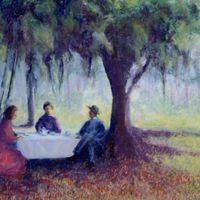 “Dakin Family by Bettye Reagan.” RICHES of Central Florida accessed April 23, 2019, https://richesmi.cah.ucf.edu/omeka/items/show/6941.